I've been receiving school trips to the web site recently. I'll suddenly have thirty or forty people online all at once, then I'll receive a flood of questions to my in-box. All good stuff! I've also been asked about membership for schools rather than individuals. To that end I've been putting together a school membership package. It'll be available in the next day or so so if you are interested, drop me a line. I've also been re-laying the buttons on the website. I've done most of the art work for that so it should be online soon. Finally, in a rather busy couple of days, I've been working on a new model for the Christmas season. I'm not revealing all yet but just to let you know, this one involves both Santa, and my personal Christmas hero, Ebenezer Scrooge. OH My GOD! Rob, this is thrilling news! 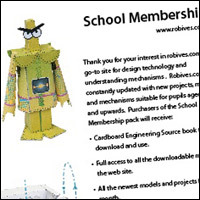 I can't imagine anything much more exciting than a Rob Ives online school! Ack! This could be the shining answer to the ailing educational system! Have remarkable people teach what they know to groups online. So much can be taught through paper engineering. And there's not much that's more engaging than making things with paper as well. Win = win. Thanks, I'm putting the finishing touches on my plans for this, I think it'll be good!